Even though most of the British had recently sailed away with General Sir Henry Clinton bound for Charlestown, a small garrison was retained at Bald Head Island. The fortification was named Fort George in honor of the King, and was garrisoned with thirty men taken from various warships prior to their departure. Unfortunately, the thirty sailors only had twelve muskets. Brigadier General James Moore placed Col. Thomas Polk, of the 4th NC Regiment, in command of Fort Johnston on the mainland to keep an eye on the small garrison situated across the wide inlet. Col. Polk learned of the garrison's weaknesses and decided to go take the enemy. 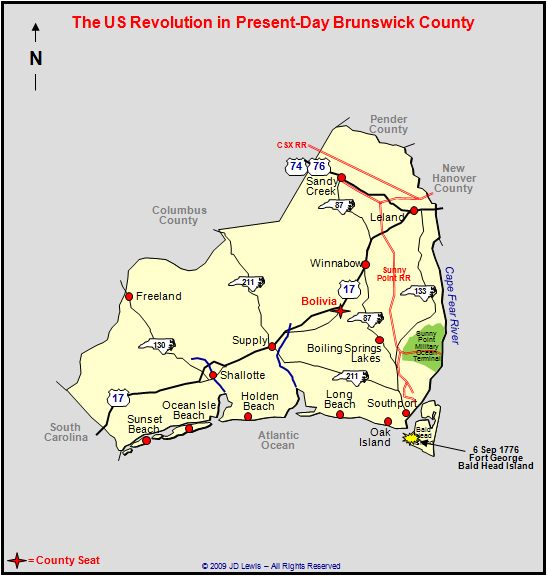 On the night of September 6th, Col. Polk sailed with 150 of his men across the inlet and landed on Bald Head Island. As they worked their way through the woods, they were discovered. The Patriots captured five sailors, but the alarm had been sounded. The other 25 British sailors took refuge in the small fort and fired upon the North Carolinians, keeping them at a distance. Soon, nearby British ships heard the shots and sent a relief force. The HMS Falcon fired her 6-pounders into the woods at the Patriots to give the relief force a chance to arrive. Col. Polk had one man killed and one man wounded, then decided to withdraw. As they left, the NC Continentals burned a British cutter so that it would not pursue them. The HMS Cruizer quickly mounted four of her 3-pounders on board the sloop HMS Defiance. Lt. Dickerson sailed with five other boats around the island to block any escape by the Patriots. Lt. Dickerson discovered two of Col. Polk's boats at 1:00 am at Buzzard's Bay near the mainland. The Defiance and the Falcon fired into the woods at Buzzard's Bay, but the Patriots returned fire with a 3-pounder, keeping the ships away. The British were unable to destroy the boats and withdrew before the sun rose.